One would have thought that there was only a limited amount that could be done with an Internet browser but yet another alternative to Internet Explorer has just hit the market going under the name of Opera 9.Whilst not technically groundbreaking this new browser does offer a number of unique features that are not currently found in any other application which is why I thought it was worthy of inclusion in Click. 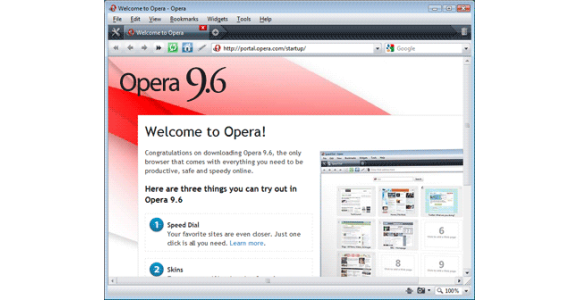 BitTorrent support: Opera 9 is the first mainstream browser to integrate BitTorrent support without any additional software.BitTorrent is a technology that uses distributed file networks to share large files such as movies over the Internet quickly and easily.Because you can download these files from multiple sources simultaneously it dramatically reduces your download times if used on a decent speed broadband connection. Widgets: Opera 9 embraces AJAX technology by providing support for widgets which are tiny little programs with specific functionality.These small applications can include newsfeeds, games, multimedia applications and so forth.Time will tell quite how useful this feature will be in the long run.To download new widgets just visit widgets.opera.com. The remaining features of the browser are pretty much standard to those used to using Firefox although current Internet Explorer users will still be in for a treat if they choose to upgrade as many of these features aren’t standard in IE. Customisable search engine: Opera allows you to choose your default search engine should you choose to make a search directly from the browser itself. Thumbnail Preview images: As well as including the fast becoming industry standard tabbed browsing Opera generates a preview image of all open tabs so that it’s easier to decide which one you want to switch to. Pop-up blocker: Again, whilst this is pretty much standard in a browser nowadays Opera goes a little bit further by improving it to stop pretty much all intrusive content no matter how creative the advertiser is. Site Specific Security – Opera can assign different security levels to different sites that you visit – Could be helpful to the slightly paranoid users out there but most home users probably won’t even touch this feature. Using the browser is made slightly more unique in Opera thanks to features such as mouse gestures which allow you to navigate just by moving the mouse in a certain way, new keyboard shortcuts and voice control to access commonly used features in the browser. As expected there is also a file transfer monitor and a password manager as well as the mandatory Opera mail, IRC chat client.The browser is extremely secure when compared with the likes of Internet Explorer which is an important consideration nowadays. To summerise, Opera is an extremely competent browser and as well as being completely free of charge is only 4.6mb in size to download from www.opera.com.Whilst it is unlikely to win away many people currently using Firefox that doesn’t mean that it is any worse and those still using the hopelessly outdated Internet Explorer 6 should really consider giving Opera a try.